We were all horrified by the events of September 11, 2001. One commentator has said that date will be the equivalent of Pearl Harbor Day for the current generation. That may well be true, but we will rise above this. Other words could be expressed, but none more accurately that by Leonard Pitts, a columnist for the Miami Herald. Mr. Pitts’ comments reflect both my sorrow and the message I would sent were I to address those that condone the events of that terrible day. 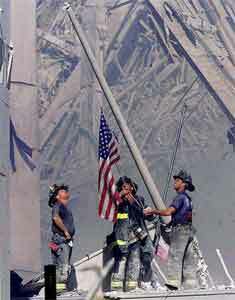 We will never forget those lost. Let me tell you about my people. We are a vast and quarrelsome family, a family rent by racial, social, political and class division, but a family nonetheless. We’re frivolous, yes, capable of expending tremendous emotional energy on pop cultural minutiae — a singer’s revealing dress, a ball team’s misfortune, a cartoon mouse. We’re wealthy, too, spoiled by the ready availability of trinkets and material goods, and maybe because of that, we walk through life with a certain sense of blithe entitlement. We are fundamentally decent, though — peace-loving and compassionate. We struggle to know the right thing and to do it. And we are, the overwhelming majority of us, people of faith, believers in a just and loving God.